How to export from New Zealand? Explain the export methodology in New Zealand. How to export from New Zealand? What are the export registration procedures, export customs process, export cargo movement methods in New Zealand? This post explains about step by step procedures that need to be finished with New Zealand government authority for exportation from New Zealand. If you need to export goods or services, a onetime registration procedure is being completed in most of the countries. Such export licence may be obtained from concerned government department if required in New Zealand. You can import or export goods if you are New Zealand legal entity. You need to register with Ministry for Primary Industries (MPI), for exporting certain product such as food products, farming goods, animal products, dairy products etc. The New Zealand Customs Service and the Ministry for Primary Industries (MPI) need to clear business or commercial goods for import and export, and document what’s coming into and going out of the country. MPI will also need to verify your goods meet the requirements of the country they’re being exported to. III. Non-New Zealand grape wine, fruit wine, cider and mead. Register with the Customs for a client code, if you’re importing or exporting goods or products worth more than NZ$1,000. All suppliers importing into or exporting from New Zealand require a supplier code. If you’re a New Zealand exporter, you need both a client code and a supplier code. Trade Single Window (TSW) provides options for submitting lodgements, including direct connection via electronic data interchange. The New Zealand Customs Service is the government agency with the job of ensuring the security of our borders by protecting the economy from harmful imports and exports. Use an electronic cargo information (ECI) clearance if your export’s free on board value is worth less than NZ$1000. You can only lodge ECIs if you use EDI software. You need to register for the Trade Single Window (TSW) system if you’re exporting anything worth more than NZ$1000 (Customs value). To become a Trade Single Window (TSW) Registered User (declarant), you need to apply to be a user and for a declarant code. The exporter should make sure that they made all of the accurate export documents that are required to get the goods delivered through the port, cleared customs, satisfy all compliance and regulations, then loaded on board the determined carrier. All export documentation must be completed correctly to avoid any missed shipments, port demurrage charges or fines to the business. This post explains about different phases in export process that every exporter needs to go through for completing export from New Zealand. Please guide to export from BLUFF. Help to export from CAMBRIDGE. 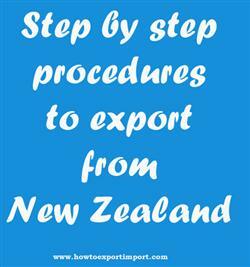 Procedures required to export from CHRISTCHURCH. Requirements to export from DUNEDIN. Clarifications to export from INVERCARGILL. How can I export from LYTTELTON. What should I do to export from NAPIER. How to export from NELSON? Formalities to export from NEW PLYMOUTH. Procedures to export from PORT CHALMERS. Need to export from PORT PEGASUS. Explain to export from TAURANGA. Information to export from TIMARU. Step by step process to export from Auckland. Methods to export from Christchurch. Guidelines to export from AUCKLAND.